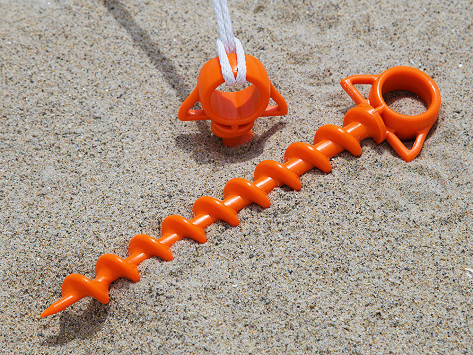 This Made in the USA spiral ground anchor screws into soil to secure lines in a simple, easy-to-use design. 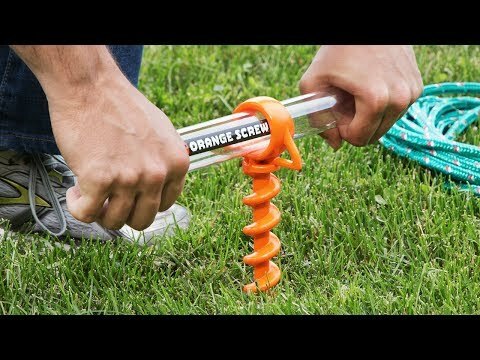 It doesn’t take a lot of pressure to drill it into the ground. To anchor in firm soils, insert the drive handle for added leverage. It’s a great solution for tents, tarps, or quick tie-downs that can handle up to 650 pounds. Screws are 12.25" long and have a thread diameter of 1.125"
Holds up to 650 lbs. Dimensions: Single: 12.5" x 3" x 1.5"; 2 Pack: 12.5" x 6" x 1.5"
Weight: Single: : 0.38 lb. ; 2 Pack: 0.63 lb. Boy do these things hold! Perfect for holding down baseball batting cage that tended to walk in the wind! Founder Kirby Erdely is at the helm of this family business. He’s paired his background in design with his family’s love of all things outdoors to create this handy tool.